I thought that it might be helpful to post some information to help beginners and non-designers plan out and design graphics that communicate what you want or need to say. There are a lot of things that go into making a good user-centered design and here I can only mention a few aspects to help you think through the basic underpinnings of your graphical presentation of information. Munroe, Randall. “Xkcd: Communication.” Web log post. 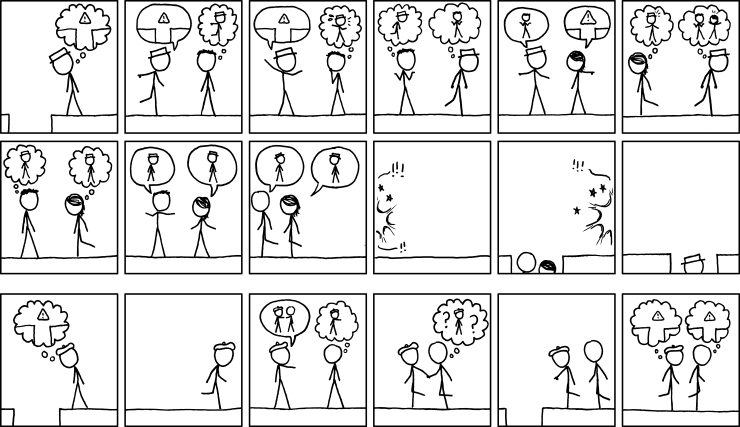 Xkcd: Communication. http://imgs.xkcd.com/comics/communication.png ©Creative Commons, Web. 08 April 2014. AS A FUNDAMENTAL POINT, it is important to understand what you are trying to say— to understand the “What” and to say it—and not something else. What you want to say should be clear and unambiguous, so that the audience will be able to visually grasp the structure in which you are organizing the information; the way that you organize the information should also match as much as possible the real-world structure of whatever you are trying to represent. 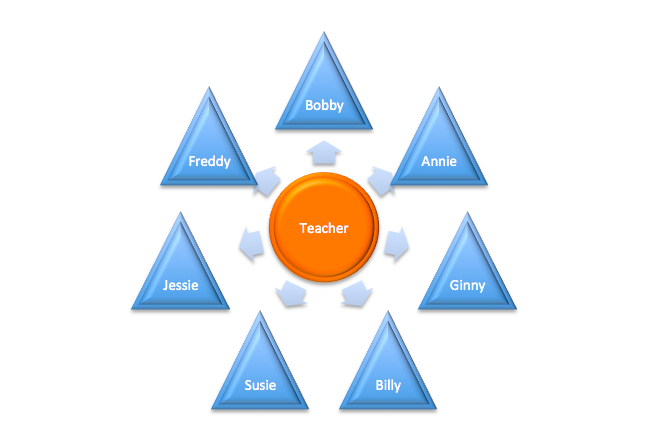 For example, if you wanted to show the structure of a course you teach, you might make a orange circle (labeled “Teacher”), encircled by smaller blue triangles, (each of which is labeled with the individual class participants’ names). A “Key” is needed to make clear to the user whatever meanings are assigned to code the colors and shapes on that graphic. Top it with a “Title” and “Caption” it below. Don’t forget to add any citation information that denotes the source permissions and copyright details of the graphic, including the website URL and date of website access. The graphic’s structure maps the real-world organization you want to illustrate. The audience sees the organization of such a chart, graphic, or picture and understands and absorbs the information more easily, because the graphic representation of the information visualizes the real-world order of—in this instance—a particular classroom structure, helping the viewers of the graphic store the new information in their memories in a way that makes sense and aids information recall. Such a graphic would match the real-world organization and hierarchy to the visual design chosen for the graphic to place it in the memory as a match for the thing remembered: The graphic looks like the thing it represents. The viewer’s memory will store such a structure along with the details, and so, the information, as a whole, can be recalled in much more of its entirety when needed by the user. A well-designed graphic will order information with clarity and precision, so that the viewer grasps both an overview of a body of information, which enlightens the viewer to a structural whole—or in other words, the big picture—and also focuses the viewer’s attention on “close-ups” of each discrete bit of information, which comprise the individual parts of that whole. A good graphic might indicate true hierarchies and patterns of order between the various elements of the information, for example, the nested sets and subsets within a dataset (e.g., administrators and the employees of their departments), the time sequence between different actions (e.g., “First you beat two eggs, then add sugar…”), or several completely conflicting elements (e.g., “Not this…, but this…”). You should ask yourself the question, “Which one of these patterns would best showcase the elements that I want obviated by my graphic design?” Sometimes the information you want to explicate can be shown using several methods (infographics, tables, graphs, figures, etc.) but not all of those modes will match your intended purpose in creating the graphic. You should understand which basic approach to use for clearly communicating your intended meaning to your audience, the user of the design; you should be clear about your intentions before you start designing. This entry was posted in Design, Writing for the web. Bookmark the permalink.